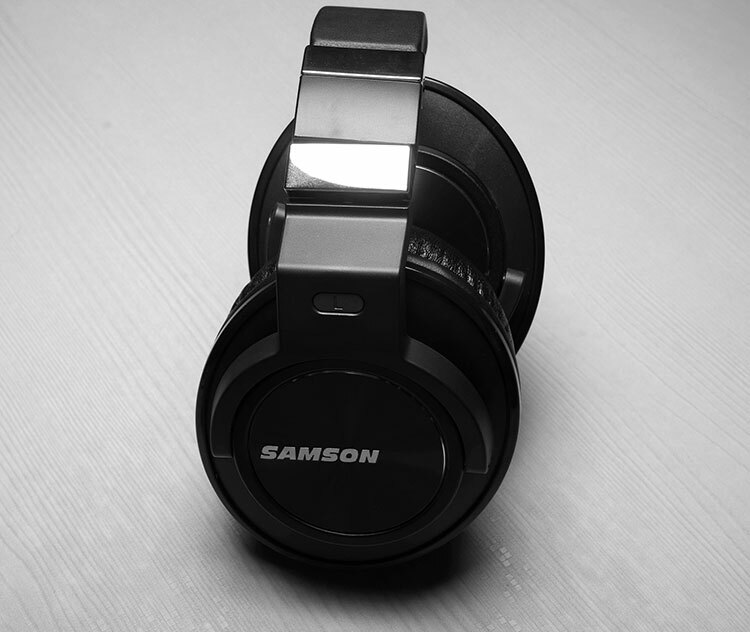 New York-based Samson Technologies have been long associated with value priced studio and concert equipment manufacturing and sales for a long time now, including a large range of budget headphones. They have no less than 17 different unique headphones with this, the Z55, being their new $199 flagship headphone just launched in mid-2016. Those with a penchant for studio type form factors from the M50 legacy will certainly swing their heads at the Z55 which pretty much falls into the same utilitarian class as ATH’s classics. The Z line is primarily targeted at the studio professional. In the case of the 45mm driver closed on ear Z55, Samson is stating that it will be this one that people will turn to out of all their headphones for the best critical studio referencing quality possible. Important tonal watchwords include balanced, detail and clarity and an immersive soundstage (not the same as big guys). All of this is packaged at a mid-fi price of $199 though the street price now is sitting at $149 plus taxes on Amazon. Naturally, Samson is competing for a piece of the DJ/Pro studio pie that ATH, then Aiaiai and the likes of Philips have all targeted recently. The robust but utilitarian look though is very traditional rather than the more modern aesthetic of Aiaiai and Philips ranges. This is very much an old-school pitch rather than a modern lifestyle headphone with good bass so anyone coming from an ATH M50 will immediately get to grips with the Z55. The fact that the M50x is only about $10 cheaper on Amazon also makes this an almost straight up fight. 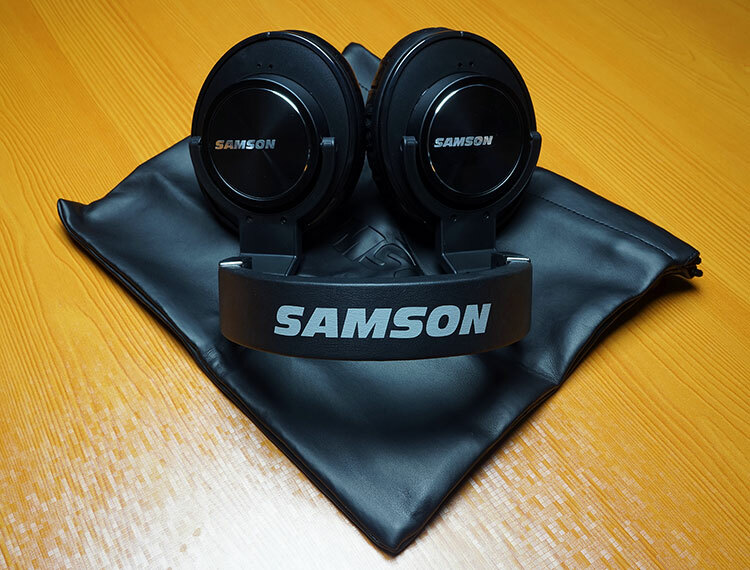 Weighing in at 240g, the Z55 is reasonably lightweight for a portable or large supraaural headphone and made of fairly solid looking black hard plastics with some metal chrome accents just above the gimbal and a polished metal cup plate with the Samson branding. The Z55 is a single-entry cable design though the jack port is a standard 3.5mm jack with locking mechanism so you can use aftermarket cables (sans lock be warned) fairly easily. The headband is finished in a soft protein leather with a decent thickness and can be extended through self-adjusting soft notches on each side of the gimbal. It is somewhat reminiscent of the Oppo PM3 headband design though perhaps a little lighter. The gimbal mechanics and foldability of the Z55 is excellent and varied. There are roughly 4 different ways you can maneuver the Z55; cups swivel and flat, cups tilt and flat, cups inwards folding and pointing downwards at a 90-degree angle. If you are mixing and listening, recording or whatever then the ability to fold one cup away from your ear is a big plus. Folding flat is comfortable and useful, especially in the field, folding inwards is excellent for portability. However, when recording throwing one pad up and out whilst keeping the other one locked on the ear can be integral to balancing what you are hearing in a headphone and the room’s natural sound. It will also prevent the pitching of instruments from sounding flat from the high sound pressure levels generated from having both cups on your ears. I would suggest the ability to push the cup forward rather than out would have been a handy fourth cup maneuver that would be a degree more comfortable but not entirely sure that would have been possible unless you redesign with a tilting mechanism and it could weaken the rigidity of the joint unnecessarily. Not 1, not 2 but 3 different types of cables come with the Z55. Most, if not all, headphones at this price range gave you maybe two cables tops, usually a coiled and straight of similar unstretched lengths. The Z55 offers both coiled and straight at 2.5m but then also throws in a more lifestyle orientated 1.2mm straight cable with in-line microphone and remote control for use with smartphones. That is pretty good value. All cables are terminated with 3.5mm gold plated stereo jacks (the 1.2m is 3 pole for the remote) and you get a quarter jack adapter thrown should you need one also. Just a side note if you are using portable amps, particularly tradition 2-pole stereo jack stages, the 3 pole 1.2m cable jack will not connect properly and you will need to use the 2 pole 3m cables. 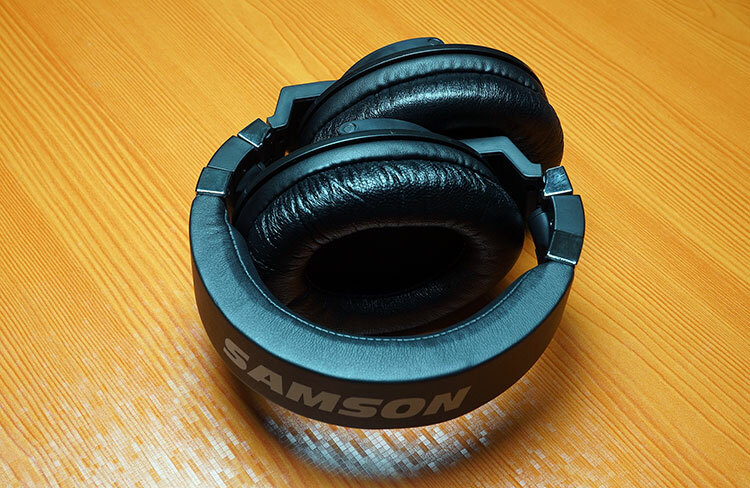 Samson classifies the Z55 as an over the ear headphone. Personally, I think it’s more of a large supraaural than a circumaural as a large part of the pads do rest on your ears and depend on that for an effect seal. The pads are made from lambskin which is a standout feature of the Z55 because at this price range I never heard of a headphone using lambskin before. That is normally reserved for TOTL stuff a few pay grades higher. Despite the slightly shallow nature of the pad, I must say it’s extremely comfortable with a decent seal for a closed headphone. It does lag slightly behind the Oppo PM3 in terms of isolation which had slightly deeper and plusher pads but the clamp is good if a little strong and the balance of pressure fairly well distributed. Clamping is more side-on than downwards which is a big plus as it keeps the Z55 rock solid in place regardless of movement but after a few hours, you will start to notice it a bit more towards your temples and crown. 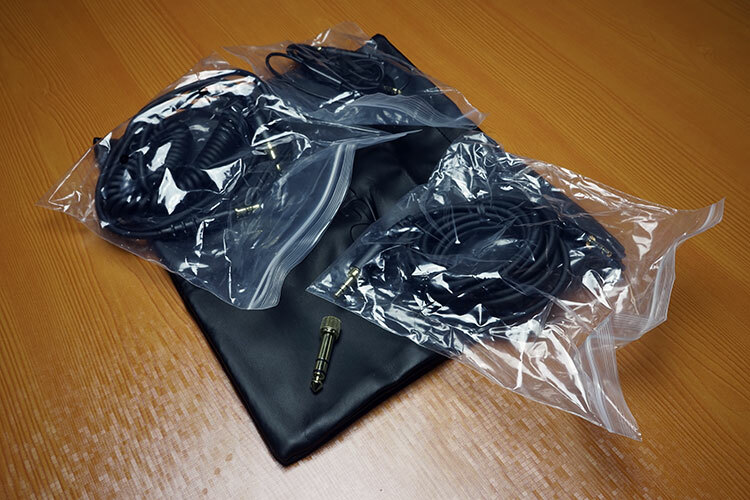 Outside of the cables and quarter jack you also get a leather drawstring pouch for carrying the Z55 folded up. It is pretty much on the same lines of the original ATH-M50 pouch, it does the job, nothing fancy and just enough protection from the elements though less so from daily bumps and knocks. The Z55 does look like it can take a few drops but it’s not indestructible so just a slight caution when carrying it around in the pouch to draw that string tightly. All of this comes in a relative simple but professional looking white retail box with egg carton style internal padding for holding everything in place. 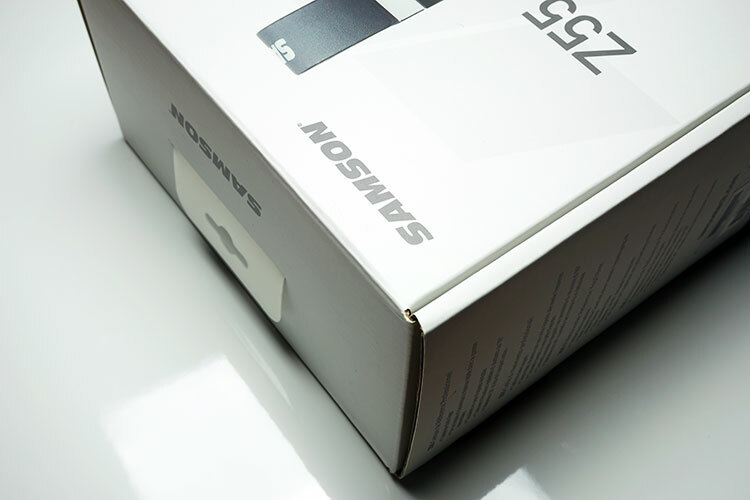 It is not as eye catching as the AIAIAI TMA range or the Philips A5 Pro box but I have never really found studio gear packaging to be all that elaborate down through the years so it is unsurprising for the Z55 either. The Z55 is a surprisingly balanced and relatively accurate sounding for a studio headphone with the emphasis more on a broader reference presentation than anything specific. I say surprisingly because I was expecting something to leap out at me given the unique tuning specifically for certain studio activities found in say the DT1770 with its dipping bass response and the lighter faster spacious trance specialist that is the Philips A5 pro. It is not dead flat though and neither is it dead neutral. There is a tiny bit of warmth in the Z55 that offers a perceptibly more natural tone than say the more congested and sharper sounding M50 and certainly sounds a whole lot more coherent to my ears for general listening. If anything, it’s a hair’s breadth closer to a slight u-shape but it is missing is a little bit of mid-bass elevation that might tip mixing to overcompensate without some external listening to balance it out. Otherwise, the extension is excellent, particularly the clarity of the sub-bass articulation which has a touch more rumble and presence than the more “correct” mid-bass. Staging wise the presentation is more about 3 rows back from the stage neither too intimate or too distant, however, instrumental positioning is just behind upper mids and vocal presence with decent top end energy and extension. This is not an imaging monster nor will it project a big a stage as the DT1770 or the A5 Pro but it does have a superior and clearer stage than the attenuated TMA-1 and a little bit more spacious in the mids than the M50. The size of a driver is relatively meaningless in terms of bass performance. I have seen mention that the Z55 bass accuracy is more down to the smaller driver being unable to spit out decent bass. Of course, the ATH M50 also sports a similar 45mm driver and it’s never been shy in the bass department. Equally, the Soundmagic HP150 with its rather large 53mm drivers as well as the Sony MA900’s even larger 70mm versions are relatively mid centric and bass light, much more so than the Z55. For me, the Z55 bass signature is more of a conscious decision by Samson to tune for a little bit less mid-bass peak and a little bit more gradual 50- 100Hz fullness and dip the FR ever so slowly to the lower midrange but not by a huge amount. Just enough to keep instrumental clarity and prevent from overly boosting and bloating the upper bass into the mids. You get a touch of warmth but you also get a reasonably articulate performance. Mixing wise, despite the good sub-bass clarity I would hesitate to use the Z55 on EDM for sub-bass track mixing as there is not quite enough presence sub-100hz to mix the channels or for shelve boosting techniques. Something more focused like the DT1770 is more appropriate for those type of mixes with its enhanced sub-bass body and weight. For other genres or for more general referencing of monitors in studio production it’s suitably clear and articulate to get the job done. Certainly, as a general listening headphone, I did enjoy the bass balance on the Z55 better than some other competing headphones. The coherence signature was more tactile than the M50 thunderous bass which at times I found exhausting and overly dominant making it more suited to DJ’ing than referencing work without some level of calibration. Mids on the Z55 are ever so slightly dipped sub 1k with a minor but important elevation around 2-3k just to allow the vocals to breathe. Vocals on the Z55, by the way, are excellent, full sounding and lacking in sibilance. There are not terribly forward, though, perhaps more neutral in positioning but they have enough space around them to sound clear and very agreeable indeed. Instrumental separation on the Z55 is good with a hint of warmth producing a full sounding if at times slightly euphonic sounding timbre but definitely nothing lush or syrupy. Spatial cues can be easily picked out with good levels of detail and nothing feels overly smoothed out. For casual listeners, this is a relatively forgiving and easy to listen to midrange performance that should gel with most vocal types. Treble on the Z55 has a touch of sparkle but otherwise stays relatively neutral and smooth sounding. It lacks maybe the last octave in its extension so it is not an airy sounding presentation but definitely not attenuated and with more than decent resolution. Lower treble is smooth, lacking in anything splashy with good body and doesn’t sound brittle or peaky. Those looking for something a bit more aggressive with a stronger attack might be better served with the brighter sounding M50 treble response but if you are coming from the darker TMA-1 or the harsher HD25-1 II treble you will appreciate its slightly more balanced and neutral treble signature. 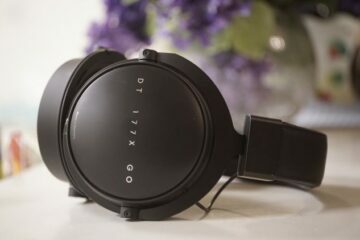 The Z55 is a 32 ohm 98dB rated headphone which places it right beside the M50x at 38 ohms and 99dB and pretty close to the Nad HP50 at 32 ohms and 100dB. 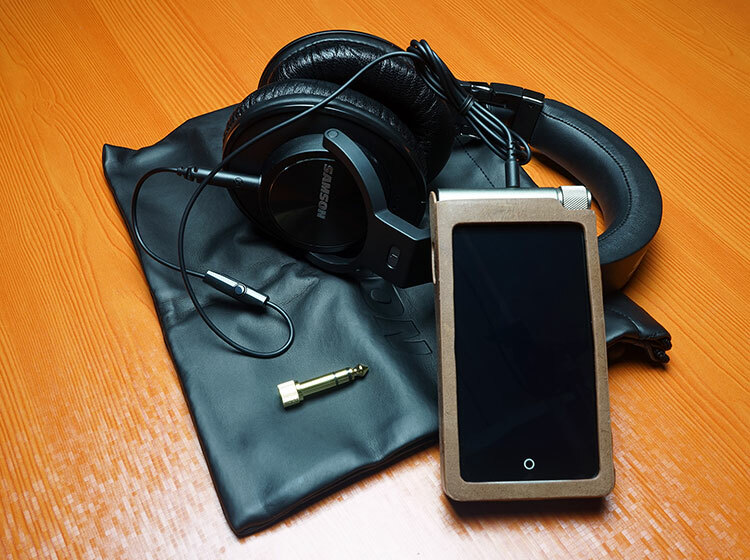 It is slightly less sensitive than the TMA-1 at 110dB and the Philips A5 Pro which is 16 ohms and 105dB. Nevertheless, much like the M50x, you will not need a huge amount of power to drive the Z55 though dynamics can take a slight dive with basic amp setups such as smartphones which have a tendency to soften and shallow out the bass presence a little compared to a better-amped source. For example, the ZTE Axon 7 uses an AK4490 single DAC implementation but the amping is so so. This pairing actually has a relatively clean sound with a little mid to treble dominance but nothing harsh sounding. Mids are open and clear sounding midrange but it is bass light, perhaps a little too polite and soft but very easy to listen to with a smooth vocal performance. If you are looking to extract a bit more low-end performance you will need something a bit more resolving and with a little more power. A good example of the effect of decent amping on the Z55 is the Chord Mojo. Dynamics were much improved over the Axon 7 with much better sub-bass presence and greater clarity. An altogether more vibrant presentation, excellent vocal staging, and better midrange detail. At times the Axon 7 felt a bit too smooth, the Mojo kept the signature natural but improve don the micro detail considerably. Top end extension is quick paced, slightly forward and energetic. The Mojo is a good match if you want to tease a little bit more sub-bass presence and rumble as well as a more vivid midrange. 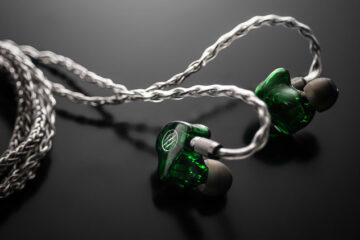 Another excellent match was the new RHA DACAMP L1 with its more neutral ES9018K2M implementation. The resolution on this pairing was excellent, quick paced, and very clean sounding. Again, whilst not an imaging monster the Z55 responded as well as could be expected and spatial cues were right on the money for me. I wouldn’t really revert to the bass and treble adjusters beyond +3 on the L1 with the Z55 as they tend to skew the balance of the Z55 making it sound either a little bloated or a touch treble peaky. My favored setting was Bass 0 / Treble +3. Just the one caveat with portable amps is if you are using the 3 pole 3.5mm cable in that not all portable amps will connect correctly or fit in fully due to the third pole for the inline remote and mic module. A small percentage of traditional amps such as the Cypher Labs Duet will be incompatible meaning you will need to use the traditional 2 pole 3m cables that come with the Z55. Decent DAPs will present no problem for the Z55 also though I did find myself erring to neutral DAPs to reference on a slightly more critical level such as the Sony PCM-D100 and X7 and warmer or more musical DAPs such as the new FiiO X5iii and the Cayin i5 for something to more musical and smoother to relax to. Power wise nearly all tested coped just fine in low gain mode with zero noise. The TMA-1 Studio is slightly more efficient on paper than the Z55 coming in at 32 ohms and 110dB and with a slightly smaller 40mm titanium driver. Released in 2012 as a compliment to the more DJ-orientated and very dark TMA-1 on-ear, the Studio is widely regarded as a flatter more correct studio tool for referencing and some mixing than the TMA-1. Unsurprisingly at similar volume levels, the TMA-1 Studio was a little louder and a bit more dynamic sounding than the Z55. Tonally both are slightly on the warm side of flat with the TMA-1 Studio exhibiting a bit more slam and body in the low end than the more linear sounding Z55. Conversely, the Z55 has a more detailed midrange and cleaner more articulate treble than the TMA-1 Studio. Both are on the relaxed side though and neither exhibit anything you could even remotely terms as strident or harsh. If I am referencing EDM I would veer to the TMA-1 Studio, I am less likely to overcompensate on the fundamentals than I would with the Z55. For everything else, the Z55 is a good candidate especially if you want something with a bit more sparkle. Despite the slightly more efficient rating both driver to similar levels with little if any volume adjustment required. We reviewed the A5 Pro last year and though it to be a very good option for old school fast bass RPM mixing for trance and it is built like the proverbial tank. Tonally it is relatively dark to neutral compared to the warmer and more euphonic sounding Z55 but it carries a very spacious and deep soundstage signature that makes the Z55 seem a lot more closed in. There is a slight roll off in the sub-bass on the A5 with a mid-bass hump sitting around 60-200hz but its tighter sounding with a bit more body than the Z55 which does have good sub-bass extension but politer mid-bass. The mids on the A5 are far more spacious than the narrower sounding Z5. Though both have good detail the A5 edges it a touch for me, especially in imaging and instrumental separation. For casual listeners, the sheer weight and bulk of the A5 are going to be a major hurdle and something where the Z55 might appeal more being lighter and smaller in size and simply more comfortable to wear for longer listening sessions. Whilst not a specifically studio reference headphone the HP50 is often referred to as a great reference headphone due to its relatively coherent and even response and exceptionally clear and spacious sound for a closed headphone. Efficiency wise they will run on much the same setup as the Z55 with similar efficiency ratings so there isn’t too much volume difference between the both on decent sources and amps; perhaps a notch higher for the Z55. Both the Z55 and the HP50 have a warmish tonality to them with the Z55 perhaps being the cleaner of the two, particularly in the mids and treble. The Nad has more sustain in its note giving it a “chunkier” sound, particularly in the mid-bass response, whereas the Z55 has a cleaner leading edge particularly in the mids and treble response. The HP50 imaging and staging for a portable headphone is the main strength and compared to the Z55 it is superior. The imaging is unbelievably good for a portable headphone of this size. To be fair to the Z55 it’s not the only closed portable headphone that would fall behind the HP50 for imaging and spaciousness at this price point. That being said the Z55 is a relatively spacious portable headphone in its own right, more so than the M50, but it just hasn’t got the same level of imaging capability at the HP50. If it not for the slightly lightweight and less durable build than the Z55 I would be grabbing the HP50 as an alternative referencing tool for studio use. It follows similar lines to the Z55 with a relatively linear response but has a touch more weight on the low end to prevent over compensation, especially in the mid-bass. You could almost argue that the Z55 is the flatter sounding of the two in some ways. The Z55 at $149 street price is a good, if somewhat utilitarian value alternative to the more bombastic and aggressive sounding M50 and more of a pro reference choice for me than the lifestyle brands of AiAiAi and of course the Beats. It’s built pretty solid with some excellent gimbal folding options and looks like it can take a decent knock. It is more balanced tonality does offer something different to competitors like the ATH M50 as well as the A5 Pro and the Nad HP50 though with the last headphone for me this is a class above and thus priced accordingly. This is not a pure DJ headphone though. Its linear low end is articulate and extends well but it is not elevated enough to prevent accidental overcompensation during mixing. Calibration software and some EQ could alter that but I would be looking at the A5 Pro or the TMA-1 (not studio) for booth duties and the DT1770 for specific EDM mixing. It’s accurate to warm tonality is just enough on the reference sound for studio peeps during production as well as calibrate their monitors to in recording conditions yet at the same time offer a pleasing and at times euphonic timbre for enjoyable casual listening.